The Tortuga is the most versatile freestyle dancer on the planet. Turtles aren’t always slow. If you want a versatile freestyle dancer, look no further. Well, you can look elsewhere, but you will come back to this board anyways. Even we are surprised by the balance of this board. Somehow it all fits. The multiple wheelbase options give this board so many different characters. A wide set-up gives it more dampened flex for that smooth dancing and high pop, while the short wheelbase gives it a more responsive flex and big kicks. 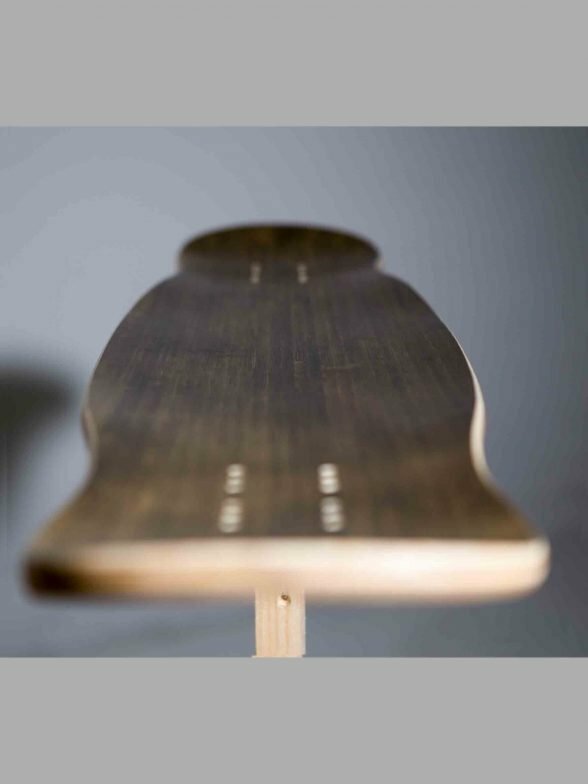 The concave is mellow and turns upward at the stance. This gives the flex a very unique feeling and a very comfortable stance. Throw in three different flex options and you can always find the Tortuga that fits your style. We could go on and on about the characteristics of this board. So we will. 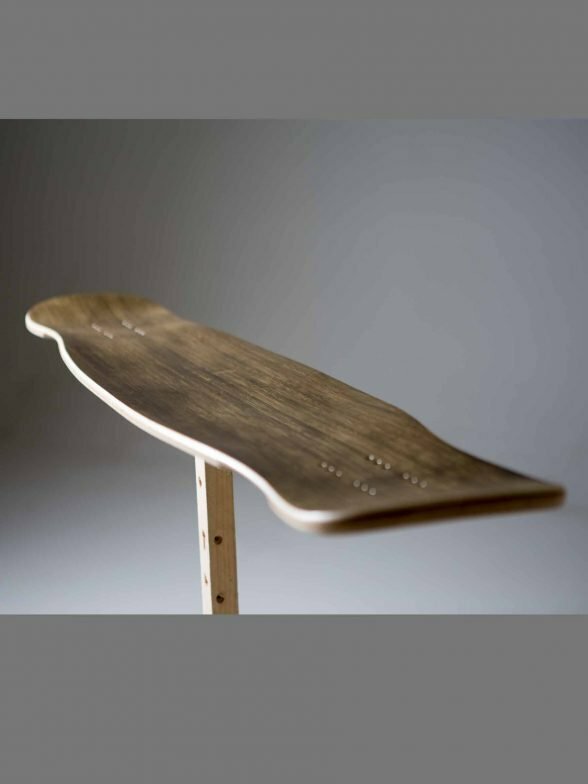 The extra strip of bamboo fitted under the kicks makes the board last longer but also gives it a nice pop, regardless of which wheelbase you choose. The waist is not to wide, making it lighter but also it affects the flex ever so slightly. We tried a lot of different shapes to finally arrive at this one. Oh yeah, and it has two stage kicks, so you can easily feel where to place your feet. Closer to the bolts for one footed tricks you will find that the concave is still there. 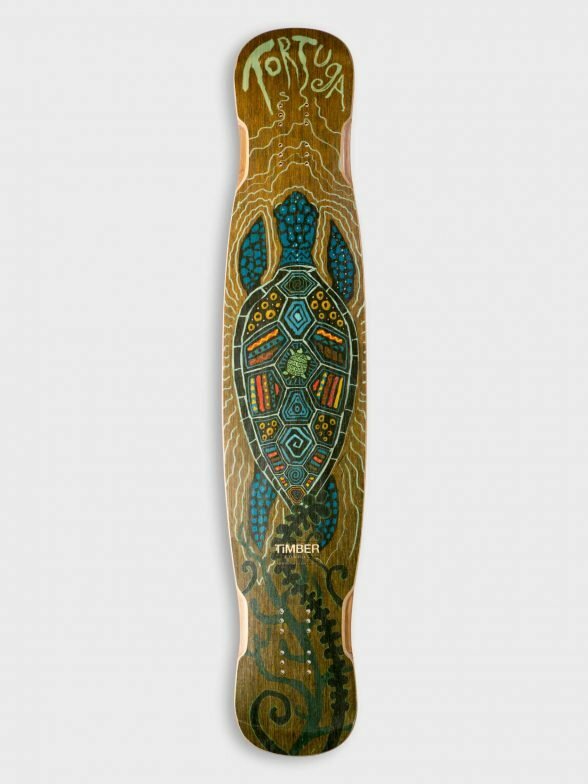 This concave allows for a better grip while doing tricks like blunt slides, g-turns, you name it. Further away from the bolts and you’ll notice the kicks curve upwards a bit more. This two-stage curve gives a lot of control during manuals. Combine all this with three different weaves of glass fiber and carbon in the kicks, and you’ve got yourself the most balanced, durable and surprising trick dancer on the market. If we may say so ourselves. Even though the concave is pretty mellow, it has a lot of subtle features. The concave in the middle is a bit less compared to the stance. After the stance it still has some concave, so even at the bolts you will always know where you stand. Don’t forget the rocker. Because of the fact that the middle of the board is situated underneath the height of the truck-mount, this board feels very stable and rocks like a cradle while dancing, even on higher speeds. The concave protrudes throughout the kicks, making them very stiff. This in turn gives the board a steady pop. Also, right after the bolts it goes a bit straight, and after that it goes up and up. In every orientation whether it’s in a manual or a blunt slide, it feels somehow ‘right’. The shape also gives it a steady feel and the extra strips of bamboo make it durable. Because of the rather mellow concave, the Tortuga is flexy. Even the stiff version is supposed to have some flex. Depending on your choice of wheelbase you can choose between a mellow flex or a snappy flex. The usage of 3 different types of glass the board has a predictable flex throughout, minimizing that weird torsional twist. The middle layer of lightweight glass gives the board a better glue bond, to further ensure a durable board. Depending on your choice of either flex, medium or stiff, you will find strategically placed heavy Carbon fiber underneath, which is concealed by a veneer of bamboo to keep it natural bro. Variable wheelbase for a huge variety of set-ups. 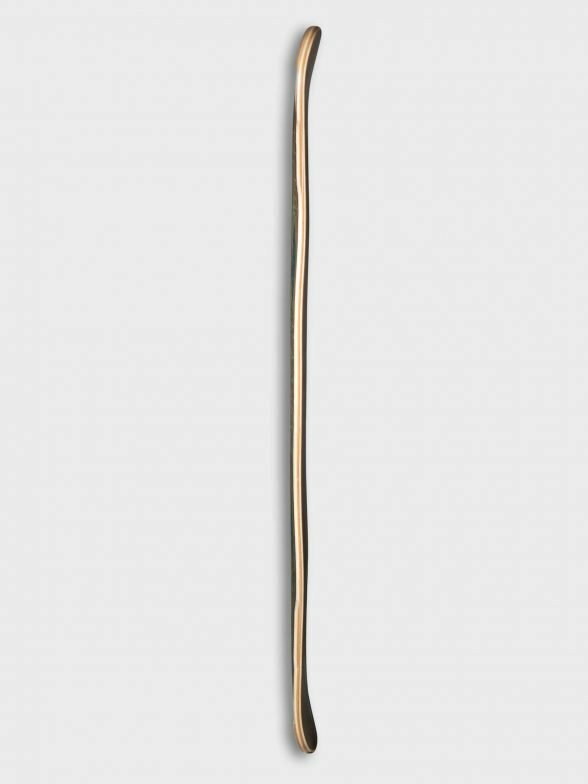 The longest is 76,4 centimeters and the shortest is 70,4 centimeters. With three different possibilities on both sides you’ve got a total of 9 different choices on where to place your trucks. Long enough for slow paced dancing, or short enough to dance fast with a slower speed. Whatever you want. 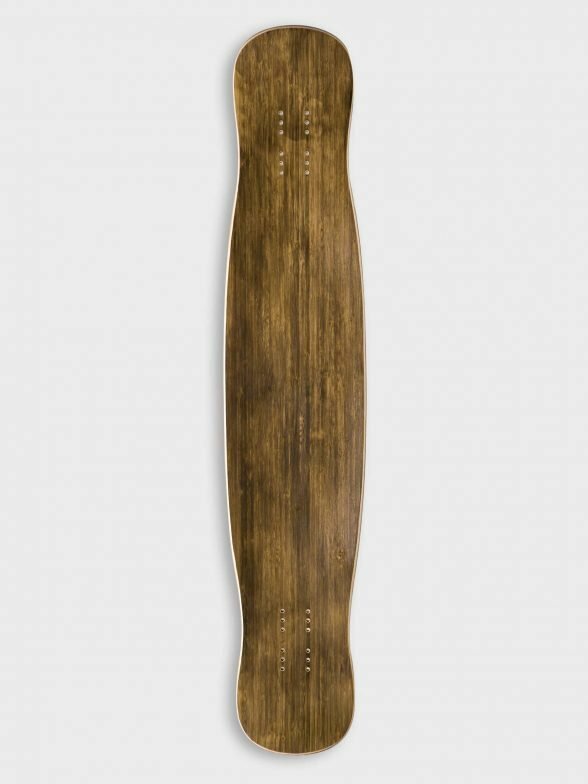 We personally believe that this board needs a dancing set-up. 50 degrees 180 trucks with 60-65mm wheels. It has wheel wells, but for larger wheels (65mm>) we suggest an appropriately sized riser. Amazing deck for freestyle and dance! I have progressed never as well as on this board! Best board I’ve skated so far. Durable, light and the concave really feels just right. Absolutely love my Tortuga. Originally bought a soft flex and once it came my wife liked it so much she stole it from me lol, so I turned around and order another with medium flex. Timber took the time to make the second one special to me and I’ll never forget it. Love the shape, concave is amazing for dance, light weight, extremely tough, and has great pop. I’m very impressed with the quality and the personal experience Timber provided.